S2L Drops displays drops according to the audio input. ▪ BPM - Defines the speed. The default speed is 1500. Valid values range from 0 to 9999. ▪ Size - Defines the size of objects [Width, Height, Depth]. The default values are 1, 1, 1. Valid values range from 0.01 to 1000. ▪ Length - Defines how long the trace of a drop is [in % of the Matrix Size, depending on the direction]. The default value is 10. Valid values range from 0 to 100. ▪ Length Offset - Defines if an offset is added to the trace of a drop [in %]. The default value is 0. Valid values range from 0 to 100. ▪ Sensitivity - Defines how quickly and accurately MADRIX reacts when such frequencies occur [in %]. The default value is 50. Valid values range from 0 to 100. 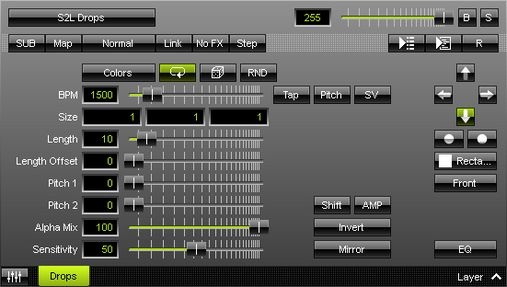 Mode - Allows you to choose the mode in which way objects are generated [EQ, Level Mono, or Level Stereo]. The default Mode is EQ.